Located within the district of Pathanamthitta in Kerala, Adoor is a traditional town famed for its culture, temples, festivals and locations. Adoor is situated at a distance of about 100 km from Thiruvananthapuram and about 140 km from Ernakulam; this strategic position makes it a gateway to both these cities. 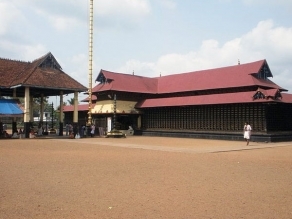 The history of Adoor thrives with a number of ancient temples, for which the town is primarily known. Numerous temples located in different parts of the town have contributed massively to the emergence of its unique culture characterized by festivities. Parthasarathy Temple, the presiding deity of which is Lord Krishna, is one of the major attractions of the town. Pandalam Mahadeva Temple, Pattupurackal Devi temple, Puthenkavil Bhagavathy Temple and Sreenarayanapuram Mahavishnu Temple are the other prominent religious spots of Adoor. Thousands of devotees are attracted to this small town as it is home to the famous Sreedharma Sastha Temple in Chennampallil and Mahavishnu Temple in Elamannoor. St. George Orthodox Church and St. Mary's Orthodox Syrian Cathedral are two imminent Christian monuments that draw devotees. These temples and churches play a significant role in the cultural history of that region. Moolam market, one of the oldest markets in Kerala, is situated in Adoor offering the travelers a unique shopping experience. Adoor has a climate typical to tropical areas and hence summers and monsoons are best avoided. The town has remarkable connectivity through rail and road which offers an economical travel experience. Adoor enjoys a good connectivity by road and buses are available to the town from major cities like Ernakulam, Thiruvananthapuram and Kochi. Kayamkulam, Punaloor, Pathanamthitta, Kottarakkara, Guruvayoor, Chavara, Kollam, and Karunagapally are also connected to Adoor by road. There are luxury bus services available from Bangalore to Adoor. The nearest railway station to Adoor is the Chengannur Railway Station which is around 25km away from the place. Ernakulam is a major railhead which is around 125km away, and there are regular trains running to all parts of the country. For those who arrive by train, taxi services are available from the railway station. Travelers can take buses as well from Ernakulam to Adoor. The airport nearest to Adoor is the Kochi International Airport which is at a distance of 140 km. Kochi Airport receives good connectivity to and from all major cities in India such as Chennai, Bangalore, Delhi and Hyderabad. Those who arrive by air can avail taxi services from the airport. The holy town of Adoor has its own story to speak. It is here that the Lord Ayappa was found by the then Pandalam King. It is said that this town is blessed as it is the home of the God.